Whiplash is one of the most common injuries resulting from car accidents. Whiplash is typically a mild to severe injury to the muscles and ligaments of the neck caused when the head and neck are whipped forward and backward very quickly. The risk for whiplash is highest when a car is rear-ended and the passengers of the car are jolted forward. As described above, whiplash is caused when the head and neck are whipped forward and backwards suddenly during a car accident. That sudden force can cause severe strain to the soft tissues of the neck by pushing them out of their normal range of motion causing stretching or tearing. The motion of the neck and head is similar to the motion of a whip cracking, which is why the term whiplash is used. Whiplash can also cause concussions, so if you’re feeling dizzy, confused, sleepy, or nauseous, please contact Alpha Care or emergency doctors immediately. While some mild cases of whiplash can typically heal on their own, we recommend coming to Alpha Care to get treated. Without treatment, some whiplash injuries can cause chronic pain that will be a nuisance for many years before getting treated. Whiplash is treated with icing, pain medications, and the use of a neck brace. 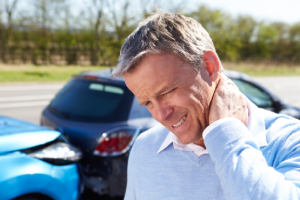 The doctors at Alpha Care will also use a combination of chiropractic care using massage, ultrasound, and physical therapy if necessary to treat more severe cases of whiplash. Let the medical professionals at Alpha Care ease your pain and worry with comprehensive approach to whiplash treatment using a combination of chiropractic care and general medicine. Call us today at 843-824-CARE for a same day appointment. We serve the entire Charleston, SC and Lowcountry metro areas with our four convenient locations and no referrals are needed!